Europe has been a top risk for the world economy for years. Is that about to change? After relentless headlines about debt crises, bailouts, soaring unemployment, recession and deflation, there may be light at the end of the tunnel. There are still obstacles to overcome, of course, notably Greece's precarious position in the euro, and the conflict in Ukraine. 1. Growth returning: The European Central Bank upgraded its forecast for eurozone growth in 2015 to 1.5% Thursday. If achieved, that would represent a significant acceleration over last year's meager expansion of 0.9%. 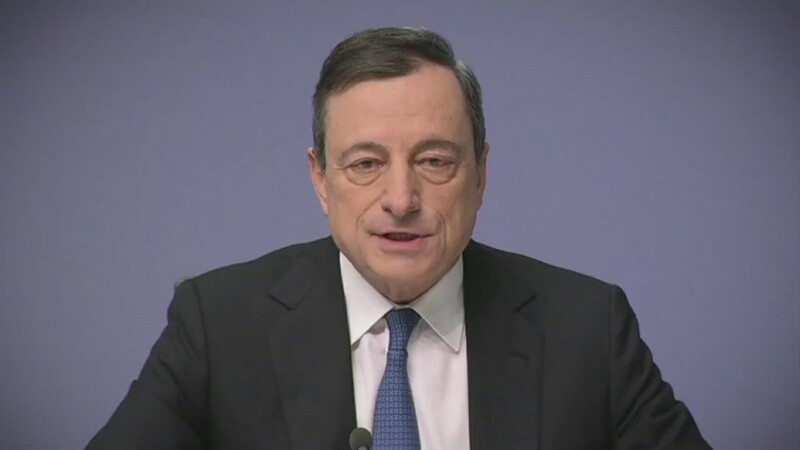 "We expect the economic recovery to broaden and strengthen gradually," ECB President Mario Draghi told reporters. Cheap oil is helping consumers, the weak euro is giving exporters an edge, and anticipation of massive stimulus by the ECB is already having an impact, even though it hasn't yet begun. Borrowing costs for homeowners, companies and governments have sunk to record lows, and in some cases even turned negative as investors pile into bonds before the ECB starts buying on Monday at a rate of €60 billion a month. Surveys suggest confidence is growing, with companies in manufacturing and services the most bullish they've been since July 2014. Even reform laggard France appears to be emerging from stagnation. All four of the eurozone's biggest economies saw expansion in February. 2. Deflation risk fading: The risk that falling prices could create a vicious circle of weak demand, and then even weaker prices, prompted the ECB to unveil its €1.1 trillion stimulus program in January. Consumer prices across the eurozone fell for a third consecutive month in February, but at 0.3% the rate of deflation was half that of January. The ECB, and many independent experts, say there could be a few more months of falling prices before inflation returns to the eurozone around the middle of this year. Inflation should then pick up to around 1.5% in 2016. That's still below the ECB's target of just below 2%, hence its plan to continue buying assets until September 2016 and beyond if necessary. 3. Unemployment falling: 18 million people are still out of work in the 19 countries that make up the eurozone, with Greece and Spain suffering the most. But unemployment is falling -- it dropped to 11.2% in January, down from nearly 12% a year ago and the lowest rate recorded in nearly three years. About a million fewer people are without work now than a year ago. Germany's labor market is in robust health, and its powerful unions are beginning to win big pay rises again. There are encouraging signs elsewhere too. Spain saw the eurozone's biggest monthly fall in unemployment in January, although with a rate of more than 23% it still has a long way to go.